I'll never understand the popularity of the Gygax modules. Don't get me wrong, Gary Gygax was a genius for writing AD&D, but I always thought his modules were rather boring hack-n-slash. There were much better module authors out there. Paul Jaquays rightly had a reputation for producing great Dungeons for Judges Guild. I think my least favourite series were (IIRC) the S- series, which were reprints of "competition dungeons" used at Conventions. They often seemed unnecessarily wacky. 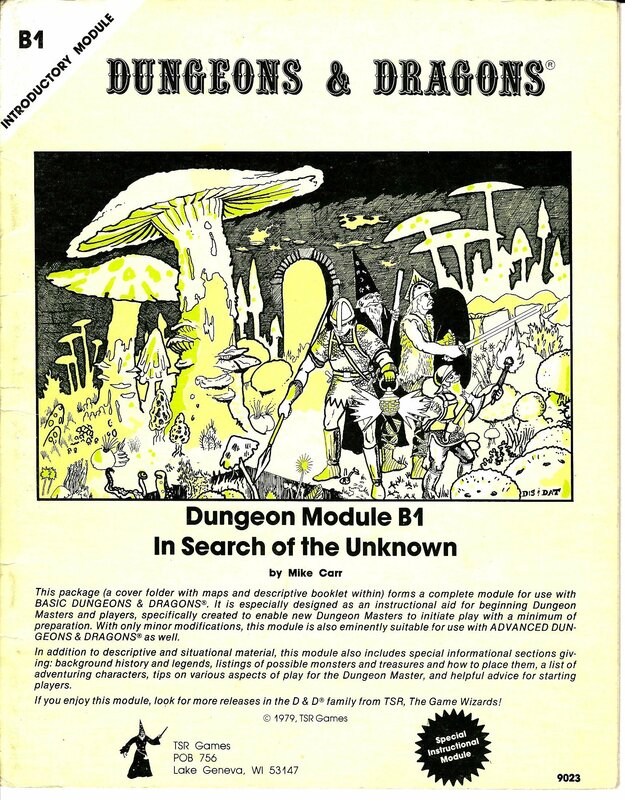 Was it Plume Mountain that was, to all intents and purposes, a D&D / MA cross-over, with the whole dungeon a crashed space ship ? Not that TSR were alone in doing stuff like that – I think the Wilderlands of High Fantasy had a treasure table that included a Laser Rifle. Yeah – that only got rolled once, and it "broke" pretty damn quickly thereafter. And they never found another one…. "fool me once, shame on you…." You are thinking of S3 Expedition to the Barrier Peaks, which is the crashed space ship. My group never played any of the S modules, as our DM viewed them as "character killers". I think we had the most fun with homemade adventures and later with the A series. S2 White Plume Mountain was good because it had a number of puzzles to solve, not just hack-n-slash. I am surprised Keep on the Borderlands is doing so well. Maybe people are just being nostalgic. It is not really role-playing or interesting, more each-room-has-a-new-monster-from-the-monster-manual-just-kill-it. Simple hack n' slash with no sense at all. The Slavers series A1-A4 was really good. Although competition modules from GenCon, it had a mystery, good story, made sense, role-playing and the characters get captured and must escape. One of my favs for sure. S2 was a good diversion. Fun and lots of interesting puzzles. I think it was boxed with the Basic D&D set – so it might be benefiting from the "my 1st adventure" nostalgia. Well I lost my Level 4 Elven Rogue in there. Let me just say do not roll a "1" when you are moving from disc to disc over a river/lake of lava. There is no coming back from that when you roll that "1". Well it was one of the first outside adventures for level 1-3 characters. I had a group that after they left the cave area were camping for the night by the river and in the morning there was a heavy fog rolling in. Thing is the Fog was actually being cause by the Orc Shaman and the party was about to get ambushed by a group of Orcs. I think it was boxed with the Basic D&D set. The module that came in the box set was this one. Which was another great starting adventure. I had to make some hard decisions with this and really want to have more than five choices. B2 was included in most boxed sets after the first print run. B1 only appeared in a very small number of boxed sets as they didn't print enough at the time. My own set came with B2, and I had to buy B1 when it was reissued separately. I felt B1 was the superior module of the two, but neither was all that great. White Plume Mountain is my favorite of all time. I just ran my 5E group through it and they had a blast. People who call Keep on the Borderlands "hack and slash" missed the point. Probably also missed the notes about the politics in the Caves. Also almost definitely missed the Reaction Roll table. Re-read the Reaction rules. Then realize why Charisma is actually the most important stat a player can have. In pre-2nd edition D&D, monsters weren't all "attack players on sight!" You rolled to see how they reacted, modified by your Charisma. Instead of "open door, kill monster, rinse, repeat" until you died or got bored, you could talk with the denizens and might, say, strike up an alliance with the goblins to fight the kobolds, or turn one orc tribe against another. Old school modules weren't linear railroads where players needed to follow breadcrumbs to find "the story". They were more often sandboxes where players have agency and are assumed to be self-motivated and clever enough to come up with their own goals and solutions. Also note the XP rules for early editions: killing monsters yields little XP. Getting treasure yields lots. Ergo, hack and slash is a way to drain YOUR resources for relatively little gain, while negotiation, stealth, ambushes, and other stratagems can acquire treasure (and thus XP) without the dangerous grind.